Webinar: Collecting the Deficiency Owing on Real Property Loans after Default, Sale, Foreclosure or Bankruptcy. (From short sale to bankruptcy: We'll show you when you can collect all or part of the balance of your loan if the security is insufficient, and how you can do it profitably)! When can you obtain a deficiency judgment? When can a "sold out junior lienor recover? "Short Sales". How can you maximize recoveries? Loan fraud: How to spot it and use it to your advantage to collect the balance owing. 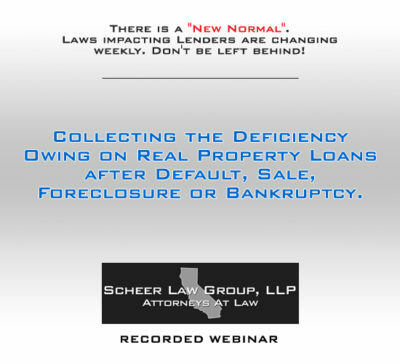 Preserving Deficiency Rights in Bankruptcy Matters (Fraud, reaffirmation and confirmation issues). New short sale and deficiency legislation in CA. More coming. Will it stop you from collecting? Detailed outline provided to every registrant. Questions to assist you will be taken after the presentation. "Patelco [Credit Union]" participated on your webinar [Collecting the Deficiency on Real Property Loans] this morning. You did an outstanding job! It was very informative." (From short sale to bankruptcy: We’ll show you when you can collect all or part of the balance of your loan if the security is insufficient, and how you can do it profitably)! When can a “sold out junior lienor recover? “Short Sales”. How can you maximize recoveries?